Army veteran Rep. Allen West served in the United States Army for more than 20 years of active duty service. He was deployed several times to serve in Iraq. On Wednesday, after Barack Obama spiked the football from Afghanistan, West posted this tweet comparing Obama to Neville Chamberlain. The liberal media reported on West’s latest criticism of Obama. 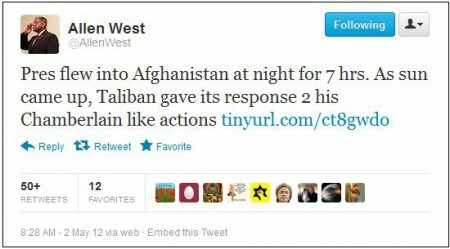 In a tweet this morning, Congressman Allen West linked to an article detailing a suicide bombing in Kabul, the Afghan capital that President Barack Obama had just departed from, and… took the side of the Taliban. The Taliban response was to detonate two suicide bombs, killing at least seven and leaving the American Embassy on lockdown during an extended firefight, according to ABC News. And the Islamist militant group has at least one congressman who is content to blame the president on its behalf for the killing of schoolchildren.